The full house at Fortune Sound Club was in for a show most would fathom unimaginable as Ibeyi played the final set of their first North American tour. The moment the French-Cuban twins appeared front and centre to deliver opener "Eleggua," it was evident the crowd was at their command, and the humble sisters let loose a performance to rival all others. The connection between the two is palpable, their harmonies beautifully brought to life on stage, and their reliance on one another for cues — and one could even say courage — echoed in their constant eye contact and face-to-face setup. The two moved right into "Ghosts," with Naomi atop the cajón and Lisa-Kaindé behind the piano, and it was simply breathtaking. The massive sound emanating from such simple composition — Lisa-Kaindé's exquisite voice and Naomi's sonorous rhythmic accompaniment — was enthralling. 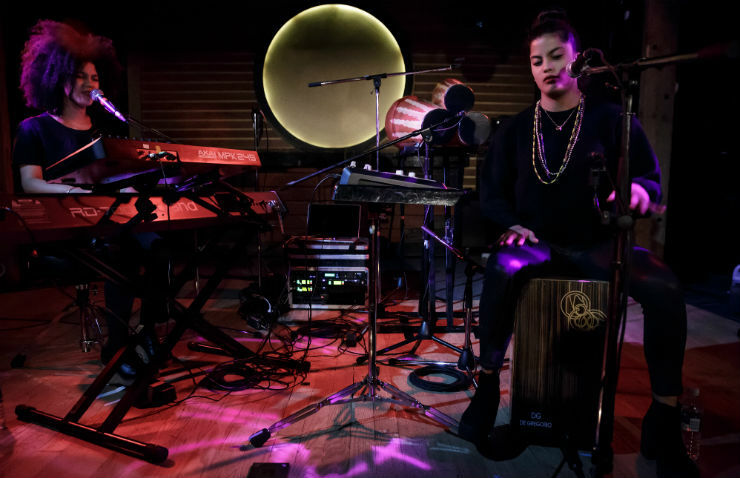 Moving into "Mama Says," Naomi used the cajón as well as body slapping and snapping to provide percussion; her energy burst forth in her movements, rising up from the edge of her seat and extending her limbs as if she could barely be contained. Banter with the crowd throughout the set in myriad languages evoked laughter and smiles from the duo, and they stepped forth to explain a bit of Yoruba lore, the two speaking for one another and stating that Naomi is the daughter of Shango — the thunder — and Lisa-Kaindé the daughter of Yemaja, the sea. Interaction with the crowd definitely set Ibeyi apart from a lot of other acts, as Lisa-Kaindé introduced every song, providing background whenever relevant. She charmingly apologized for her English numerous times after trying to express gratitude after the completion of their first North American tour, routinely calling it their "U.S. tour" before realizing her mistake and bashfully correcting it to include Canada. Midway through, Naomi whispered across to her sister and Lisa-Kaindé strolled coyly from the piano, poised at the edge of a stage, and dropped the beat on "River." The two had the audience clap in time before returning to their respective instruments, and moved into "Yanira" and "Oya," on which their harmonizing was absolutely ethereal. Naomi prefaced a cover of Jay Electronica's "Better in Tune With the Infinite" as one of their favourite artists and songs, and enlisted the audience to help sing the final moments of "Ibeyi (Outro)," dedicating it to all the twins in the crowd. There was one, to which Lisa-Kaindé replied, "That's okay! You're still a twin without your brother." After a brief absence from the stage, the two returned for an encore, setting up a call-and-response with the audience on an interactive rendition of "River" in which a simple looped beat was the only accompaniment and the twins provided additional emphasis using vocals. It was a spectacular, unexpected set that puts Ibeyi at the top of the list of performers destined for something big.